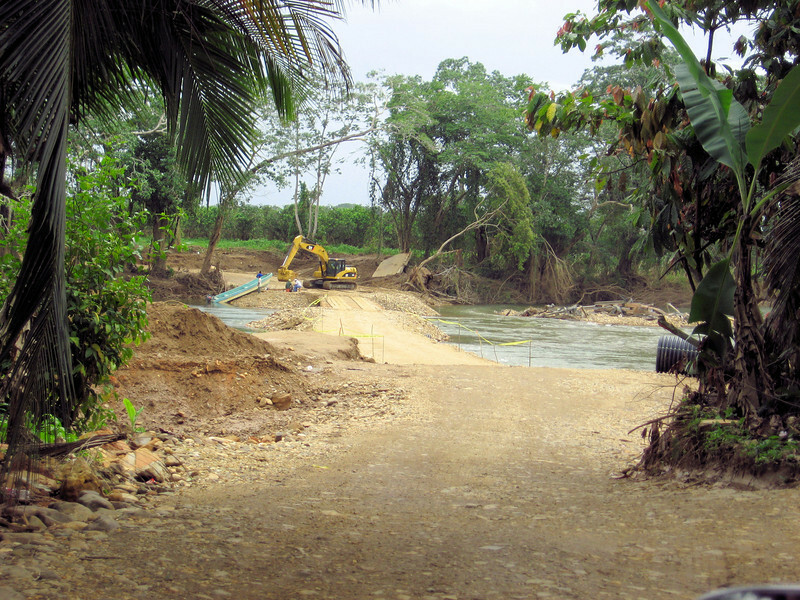 All right, we had a great time in Placencia but now, two days after the washed out bridge should have reopened it finally is. The bridge reopening wasn’t at all obvious but I heard on a morning radio ‘call in’ show saying the ‘bla bla bla crossing is now open. We’re packed up and heading out. We first stopped at the ‘Purple Space Monkey’, a cafe with a used book exchange. We had several books to exchange. Unreal, they had a 2007 Mexico guide book, just what we needed, sweet. We were going to ride through Mexico with just a small map we kept and that’s all. There’s nothing wrong with using just a map but a guide book can give good information about cities and villages and hikes that otherwise would be easy to miss. We can’t believe our luck. Heading out of town we stopped to make sure there were no planes taking off or landing before rounding the airport runway. 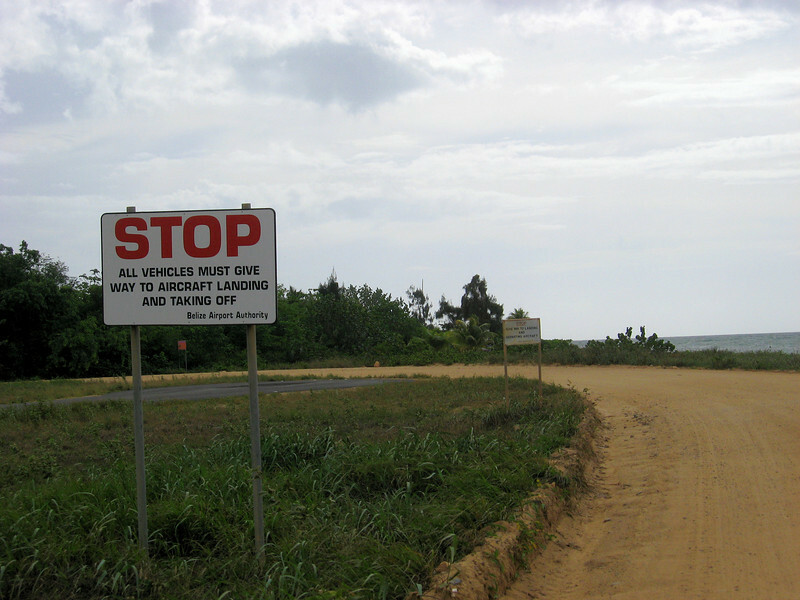 The dirt road out of town is 21 miles long running along a narrow and all sand peninsula on the Caribbean Sea. 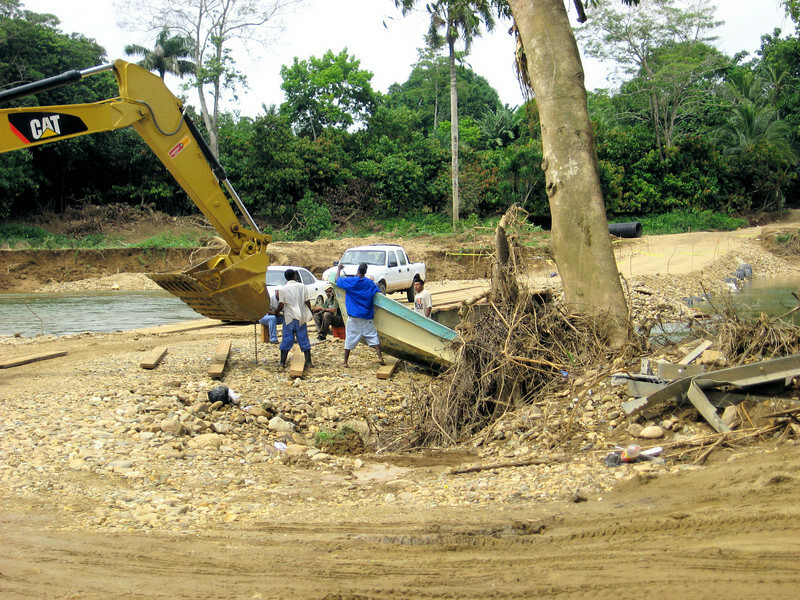 About half way we pass through a Garifuna village, Seine Bight. Heidi and I both love the look of houses built on stilts. 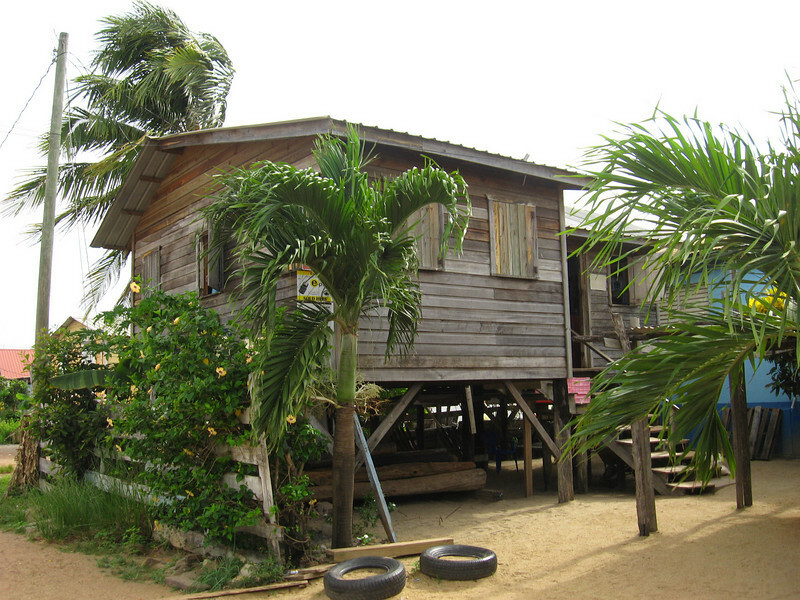 Stilt house built on beach sand, cool. 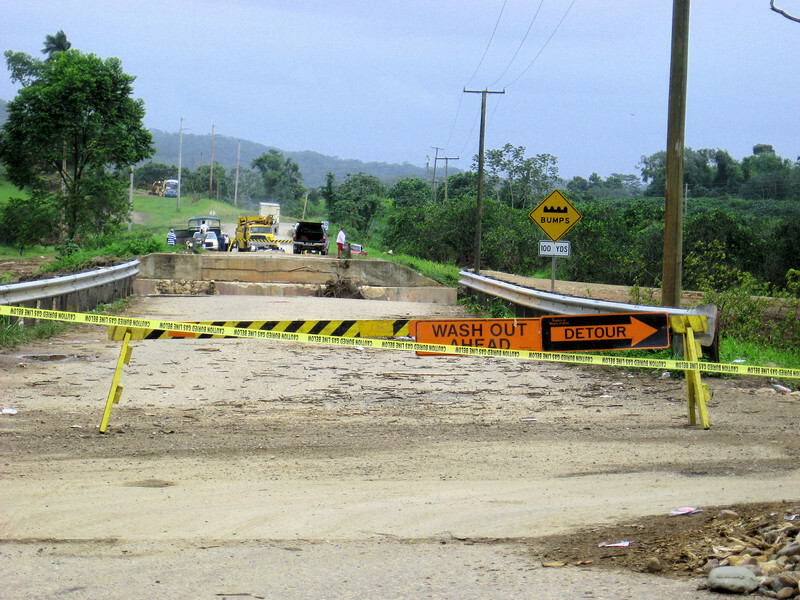 This is the bridge that was washed-out just after we arrived in Belize. 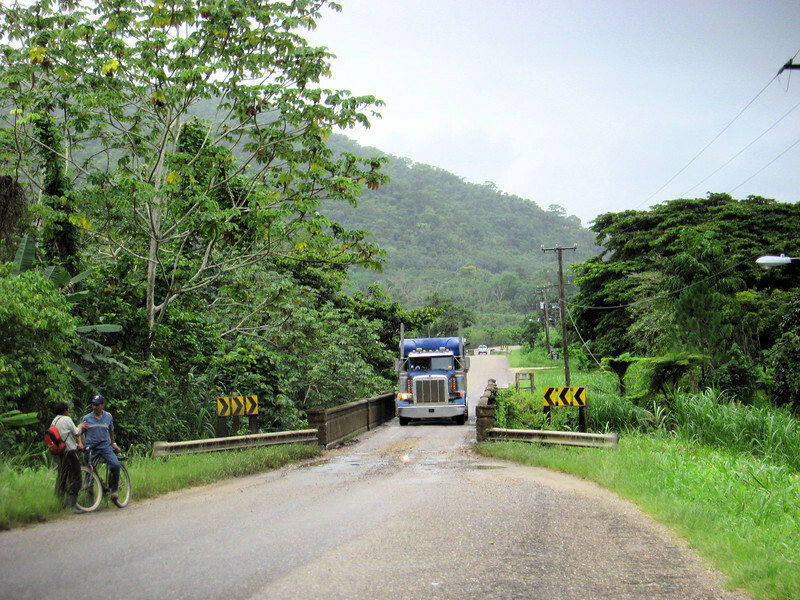 This is the only highway connecting the northern and southern regions of Belize. 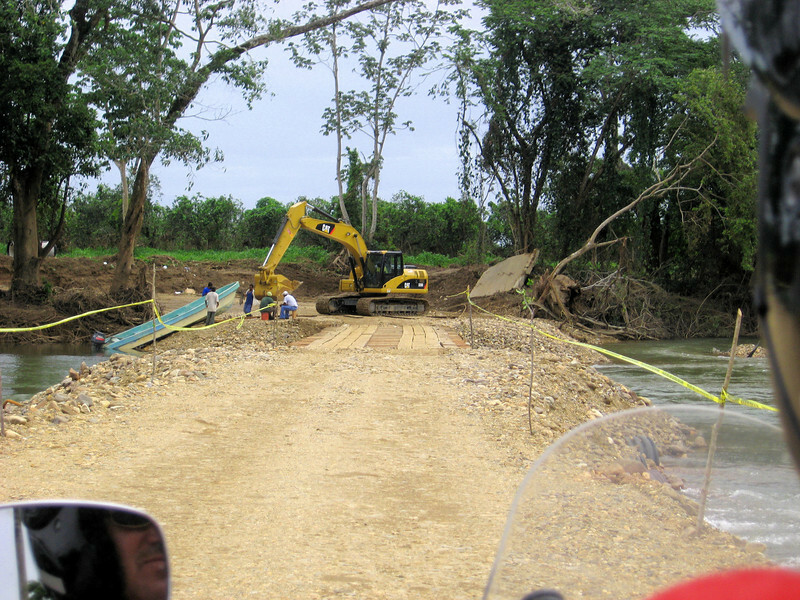 The temporary land bridge here also washed out just after we crossed it a few days ago. It’s good to see it’s now reopened. A big earth mover is blocking our way through. We can see the earth mover operator motioning for us to come ahead. The only way to get through is to ride underneath the arm of the forklift, Woo. I proceeded real slow keeping my eye on the operator and what he was doing. 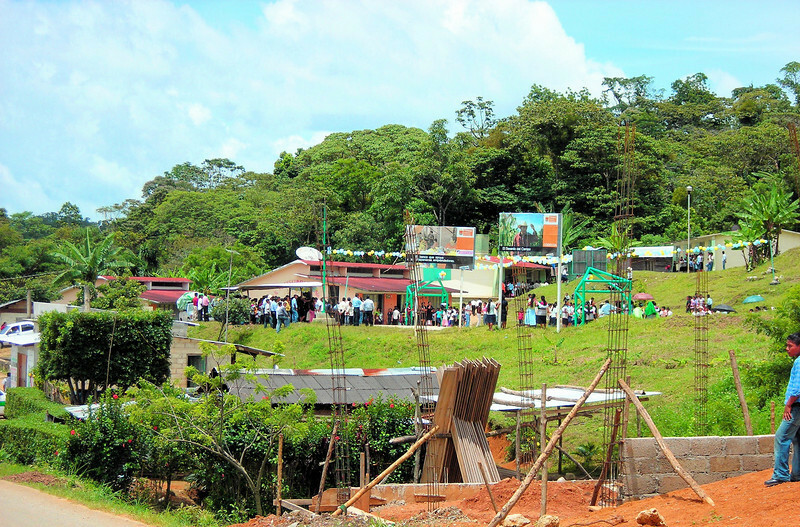 Everyone waited for us to pass through. The forklift is helping get this boat out of the water. This is the boat that was used to ferry people across the river while the land bridge was out. We heard on the radio that three people got injured coming across the river on this boat. Just before a bridge there are a few small speed bumps to give you a ‘heads up’ to make sure no one is coming from the other direction. We let this guy go first. 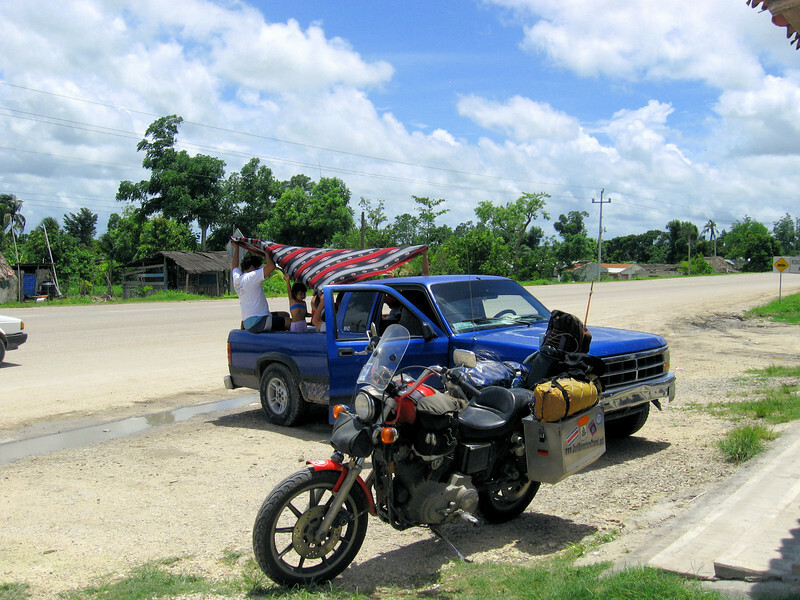 Southern Belize is a beautiful country to ride through. 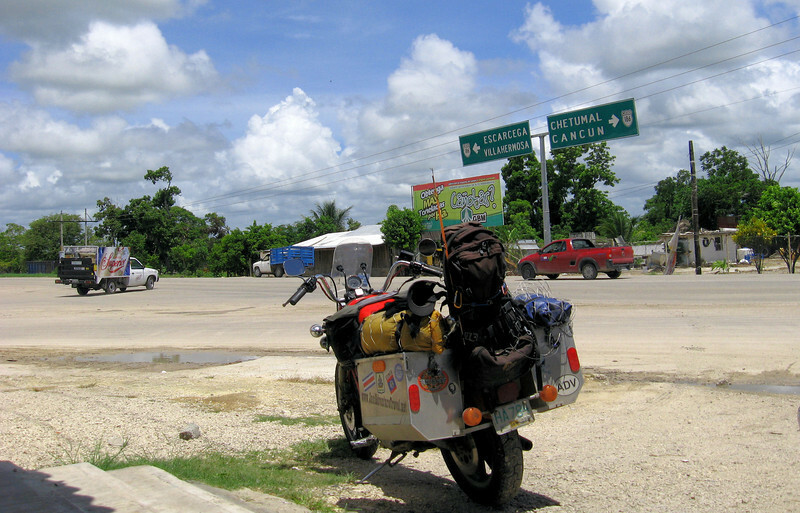 We hit some major rain about the middle of the country that lasted almost until we reached Corazol, Corazol is at the extreme northern tip of Belize. I am not at all happy with my ‘TourMaster’ rain jacket or my so called waterproof motorcycle boots. Heidi stayed dry and has the same rain suit and boots. Maybe if she was in front she would be wet also, I don’t know. 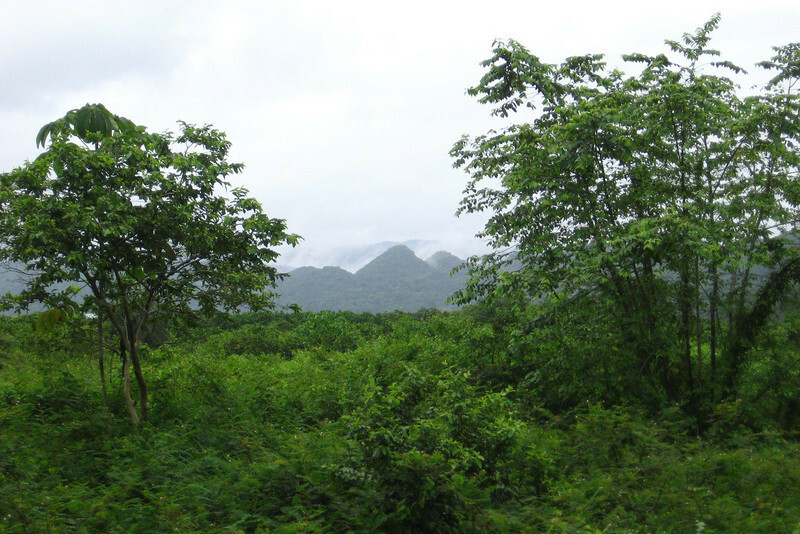 The rain stopped just before we reached Corazol, nice. 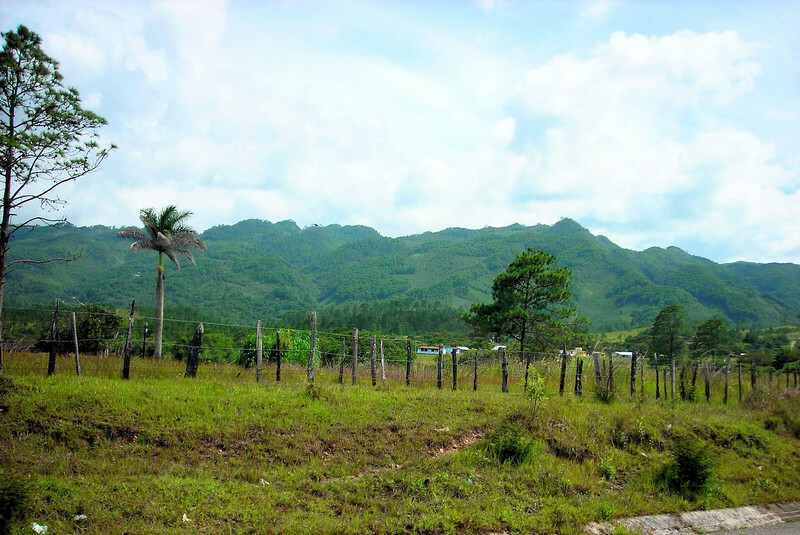 The plan is to look for a hotel here and stage ourselves for the Mexico border crossing, only 8 miles away. 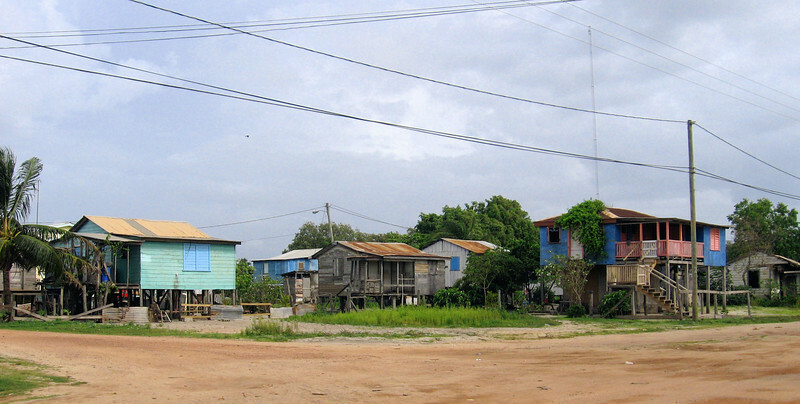 Corazol sits on the Caribbean Sea and is a nice looking village. 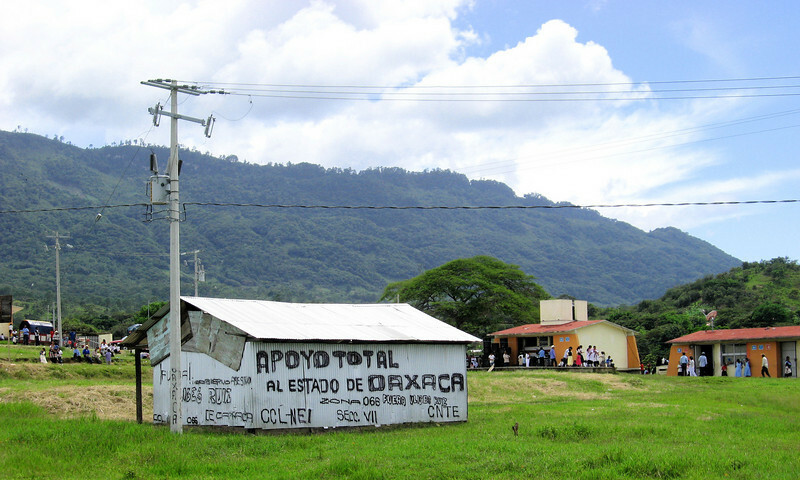 It has a beautiful town square similar to what we see in Mexico. 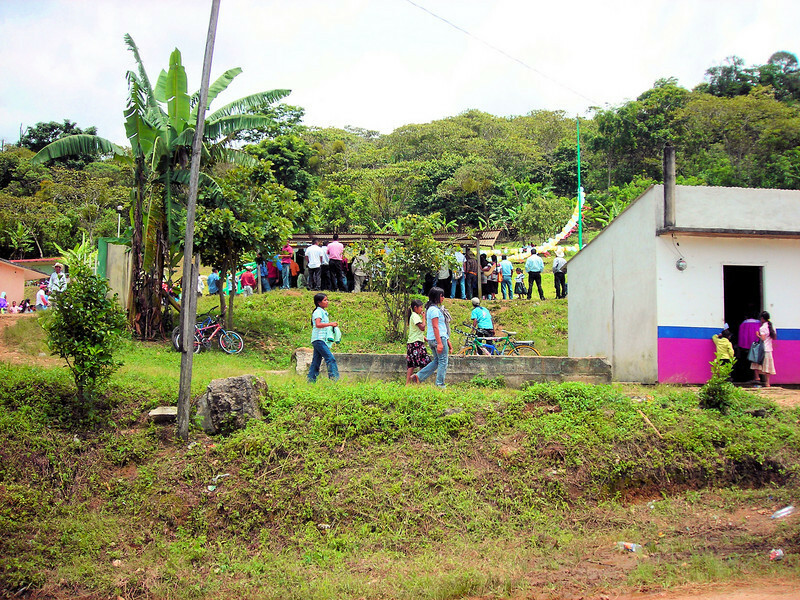 The next morning we are off to MEXICO….. 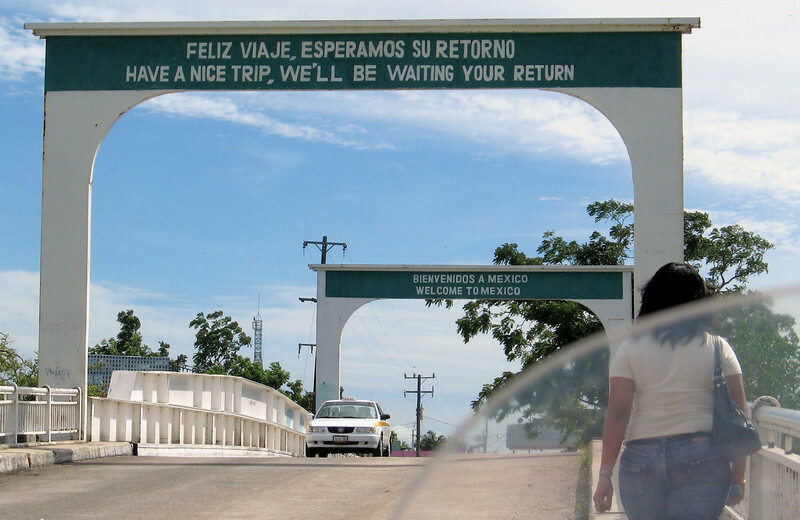 I did this border crossing in 02’. 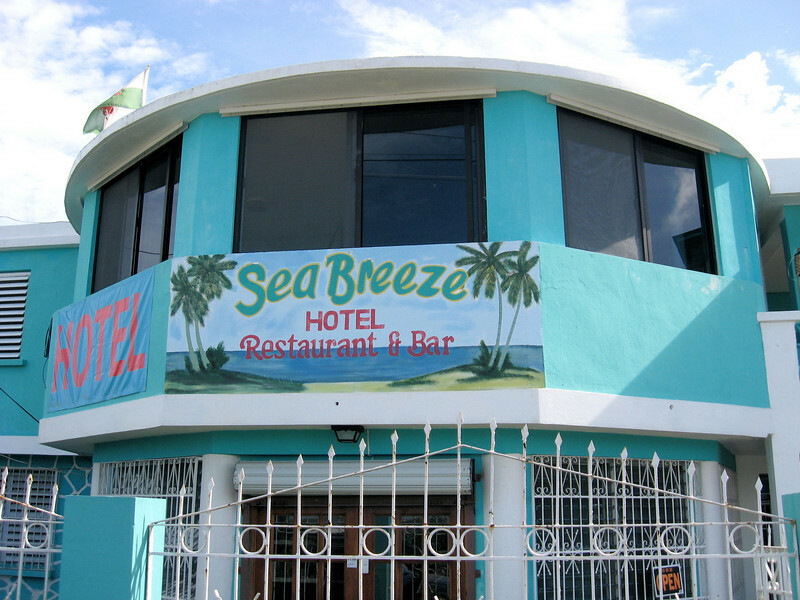 It was a breeze then and I’m hoping it’s going to be a breeze now. 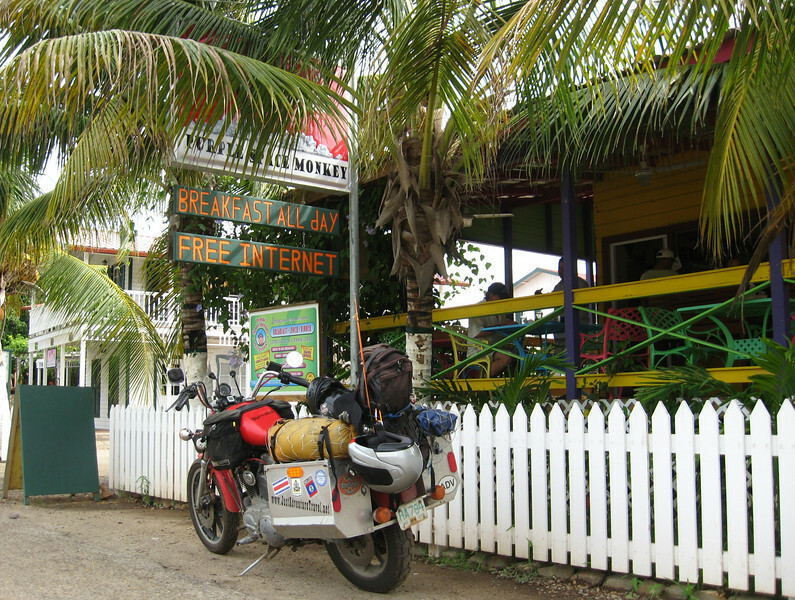 I park the bike and go in to get my Belize passport exit stamp. I pay the $17 exit fee, bada-bing, bada-bang, done. I walk over to the customs office in the same building and hand over my passport because that’s the only document I have. 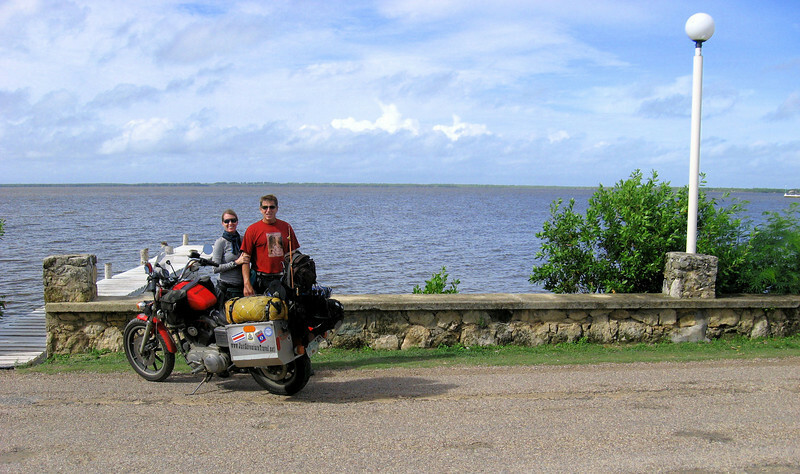 Two guys look at my motorcycle customs stamp in my passport with a puzzled look then ask me if I told the person at the first border that I was planning on being in Belize for so long and that I was exiting here. I said “yes, I told them I would be in the country for 3 or 4 weeks and that I was exiting into Mexico” (I remember the puzzled look I got from the guys at the Guatemala - Belize border when I told them this) I just stood there with a smile on my face saying nothing else. The two customs guys have a little conversation between themselves while laughing and smiling. Next one of the guys grabs a stamp and hammers it on my passport and hands it back to me. I thank them and head out with a big smile. I walk back out to the bike where Heidi is waiting yelling “Yeah who.” Several busses pull up and tons of people start pilling out. Heidi hustles in for her exit passport stamp and is back out in under 5 minutes. This is my fifth time clearing a vehicle into Mexico. It’s different from all the other countries but I have never had any problems or any hassle. This time was no exception. The woman at the customs counter was pleasant and spoke Spanish nice and slow so I could understand. I hand over all my photo copies, passport, title and driver’s license and a credit card. Less then ten minutes later I get my windshield sticker for Mexico…….. Oh Yeah. I had a hundred dollar bill ready to change into pesos with a change person at the border but there were no changers in sight. This seemed weird but nice at the same time. 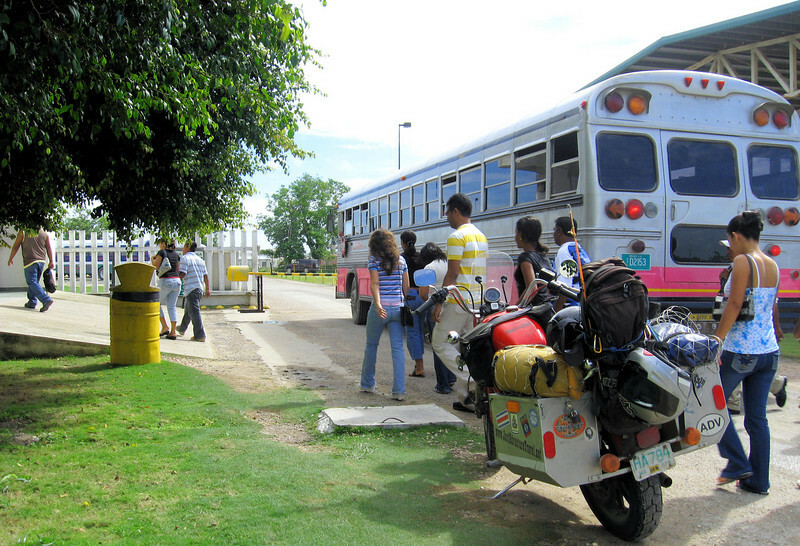 But I wanted pesos so we had to detour about 6 miles to the town Chetumal to stop at an ATM. Pesos in hand we precede to blast into Mexico with big smiles. 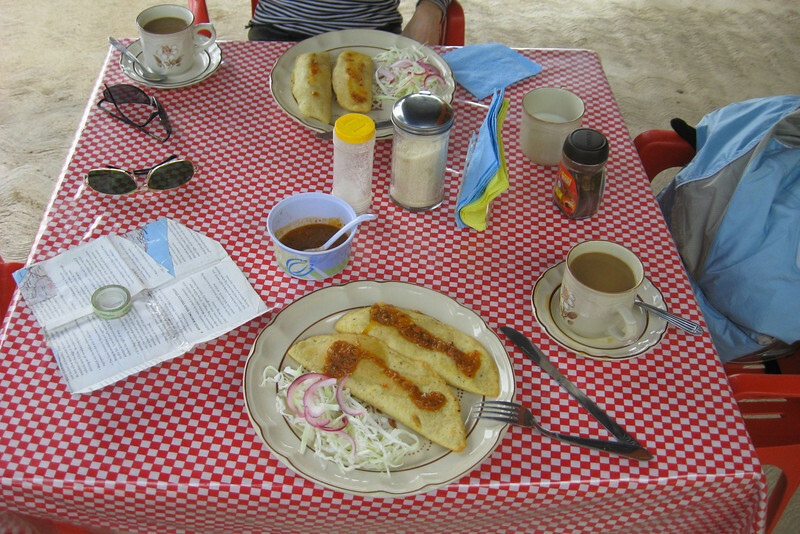 About a half hour later we stop at a road side restaurant for breakfast. We get two orders of pork carnitas with all the fixings. Fantastic, we both forgot how much we love Mexican food. This pickup truck pulls up to get food ‘to go’. As soon as the truck stopped the people in the back pop up this blanket for shade. We are on good highways now with speed limits exceeding 60 MPH. It seems strange going so fast. We both think the motorcycle is sounding funny now. I think it’s just the normal sound of the engine going fast. At around 55 MPH the ambient nose from the air passing by isn’t very loud so we can really hear the engine. I’m hoping that all it is, just normal loud engine noise. Before long the rain starts coming down in buckets. I don’t think we have had one day without rain in over a month. We pull over for gas. A pickup truck full of kids in the back pulls up. They all jump out yelling and laughing about how wet they are. 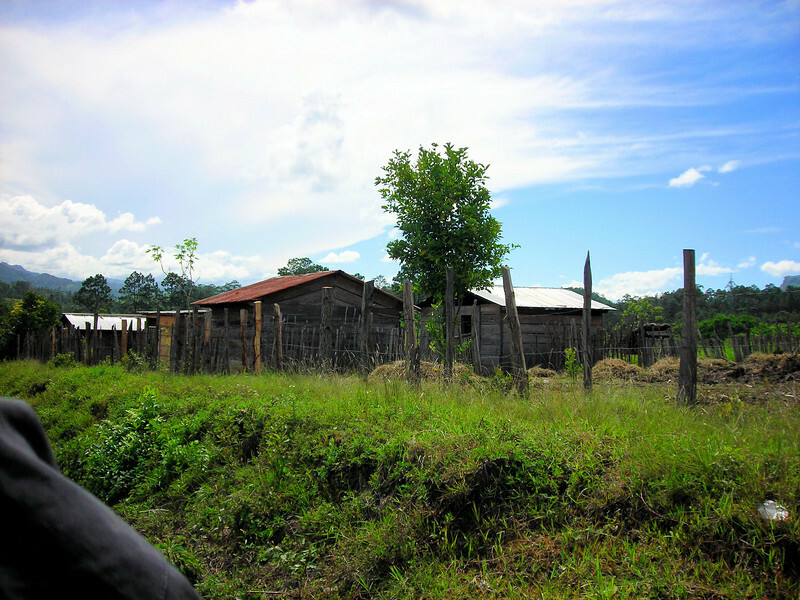 We ride into the village Escarcega and look for a place to spend the night. 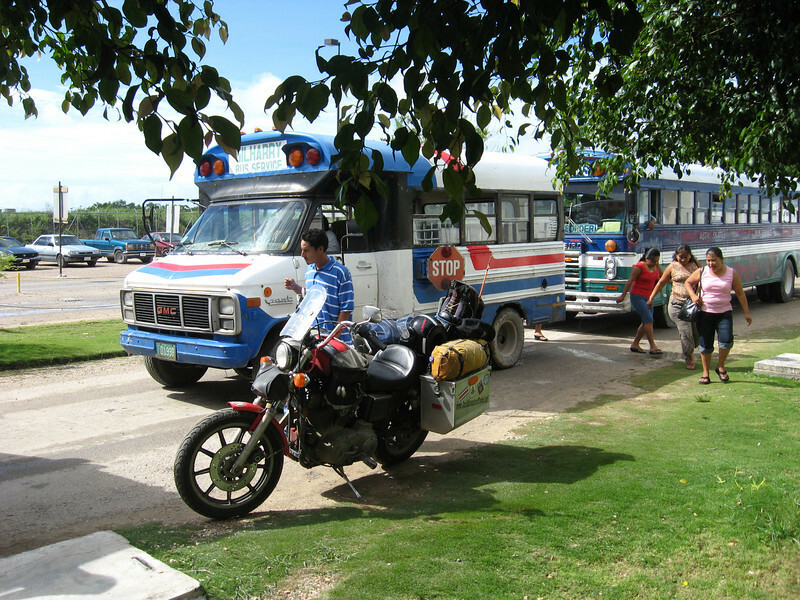 We see a hotel right on the outskirts of town with courtyard parking. 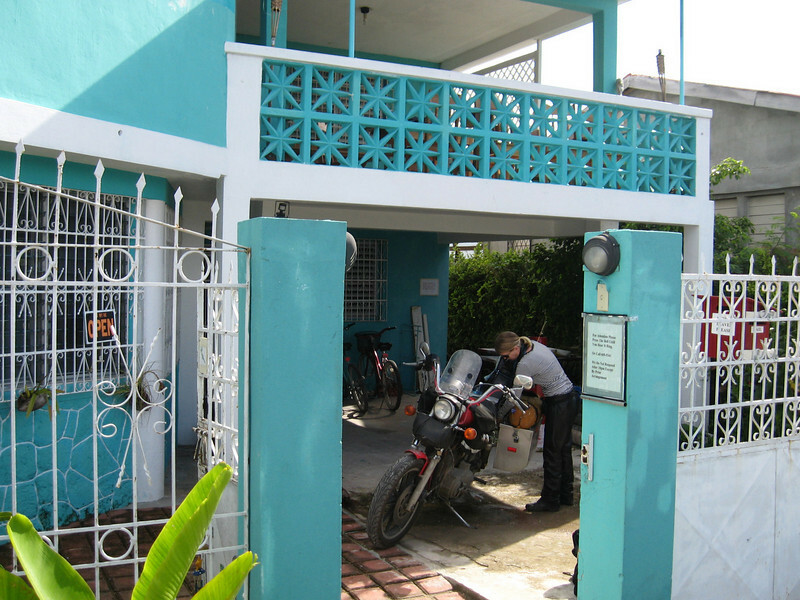 I first ride into the courtyard to inspect the parking before inquiring about the price. It looked great; we can park the bike right in front of the room. I proceed to do another one of my cocky fancy slow speed U-turn maneuvers in the courtyard and ride back to the reception desk. The bike is leaned way over with the handlebars all the way to the steering stop when I kill the engine. I was leaning too far over to recover. We go down. Boy did I feel stupid. I have never just dropped a bike before. It was laying on its side in the parking lot with gas running down the side of the tank. The guy behind the reception desk comes running out to help me pick it up. We pop it up with ease. I thank the guy and proceed to profusely apologize to Heidi telling her I will never let this happen again. It was my fault. It was a smart move, a move I cannot let the engine kill while doing. The engine is essential to complete the maneuver. I thank god I did not hurt Heidi. I ride. I make mistakes. I learn. I ride smarter. I ride safer. I ride again….. 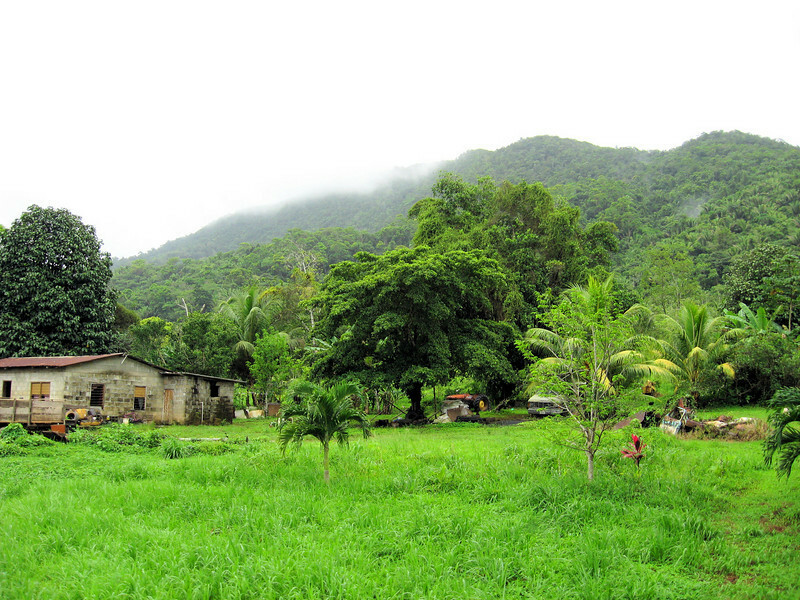 The next day we stop at a little village for breakfast. Fresh made pollo empanadas. Oh yeah….. 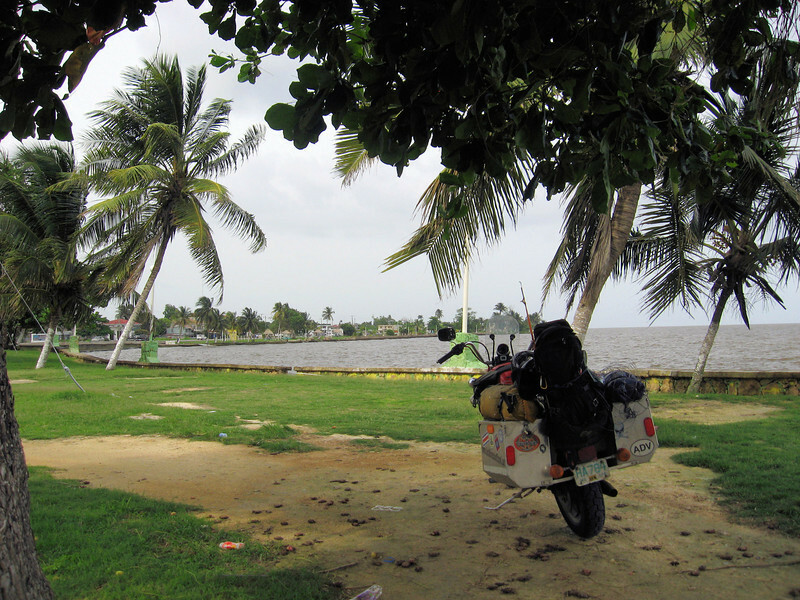 The last time I rode to Belize I just blasted along the gulf coast and only stopped at a few towns along the way. 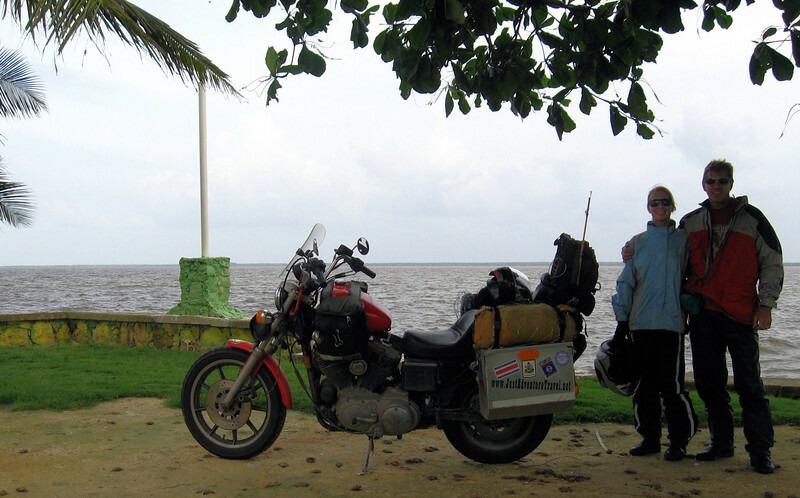 Heidi and I want to enjoy Mexico as much as possible on our return ride so the plan is to zigzag through some colonel cities on our way north. 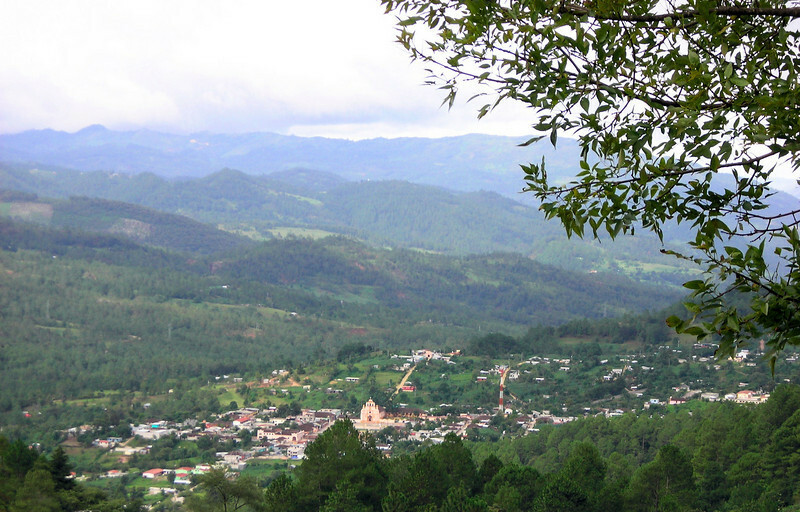 San Cristobal de las Casas is our first planned extended stop. 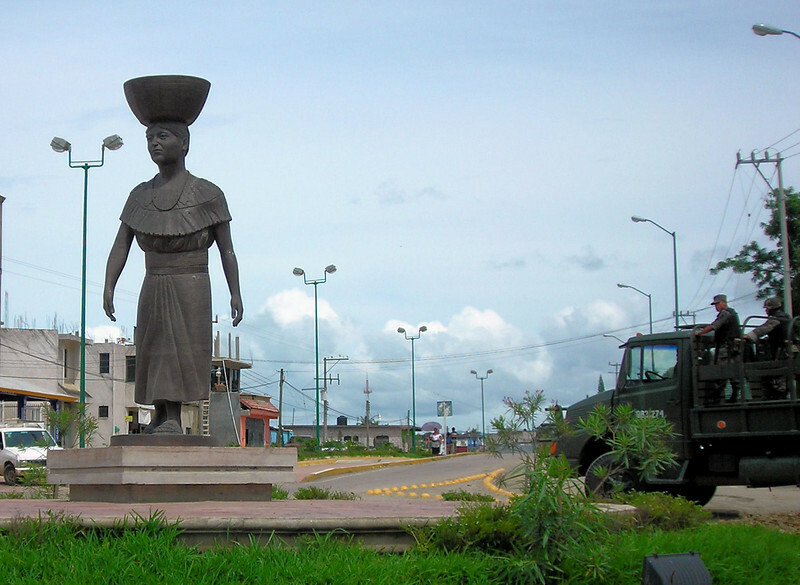 We read that this is a beautiful city with a lot of indigenous culture, sounds good to us. 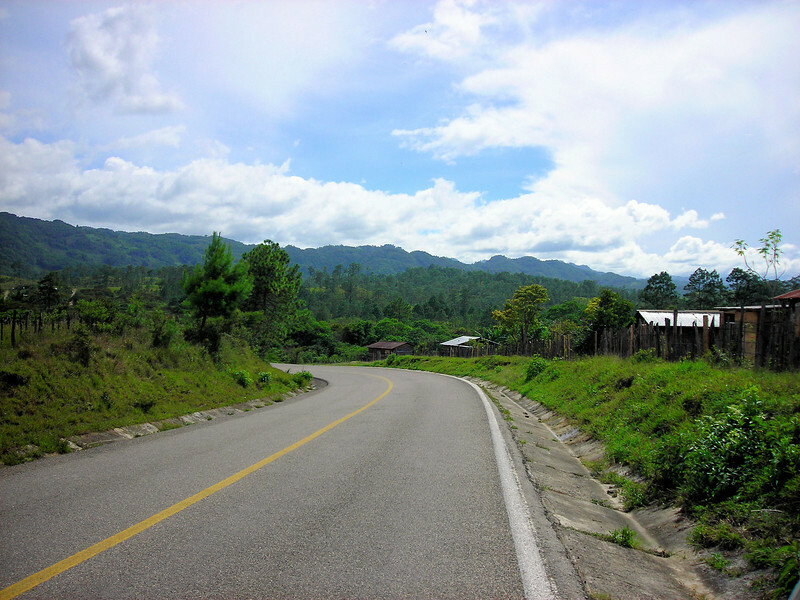 We turn left off the main highway, 186 and start riding south on highway 199 into Chiapas. 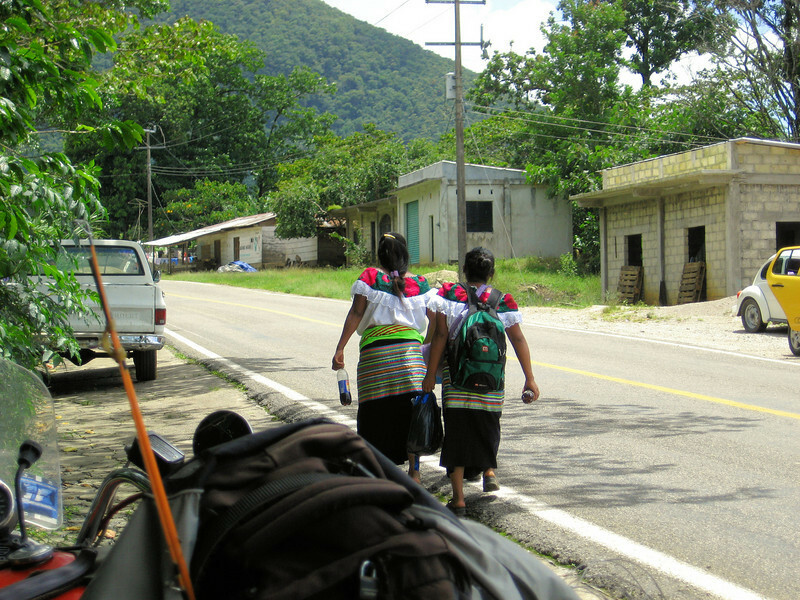 Chiapas looks and feels like Guatemala to us with all the indigenous people and crafts along the road. We are liken’ this. 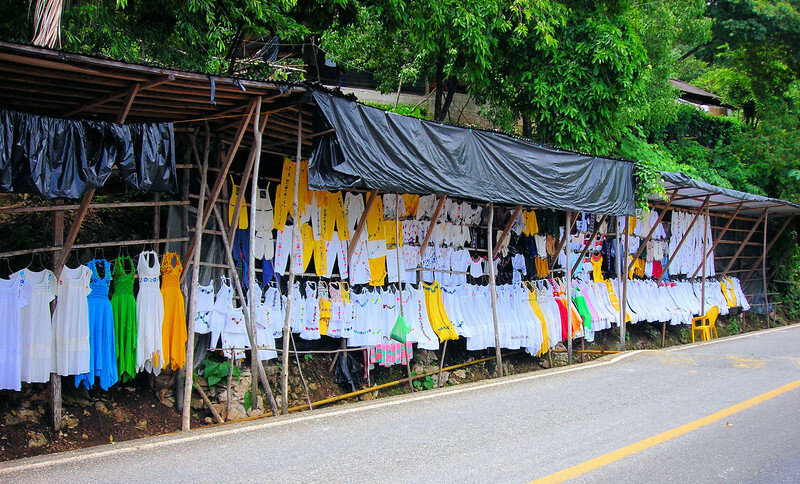 We pass some type of celebration in a small village. It looked like people from miles around all showed up for the event. 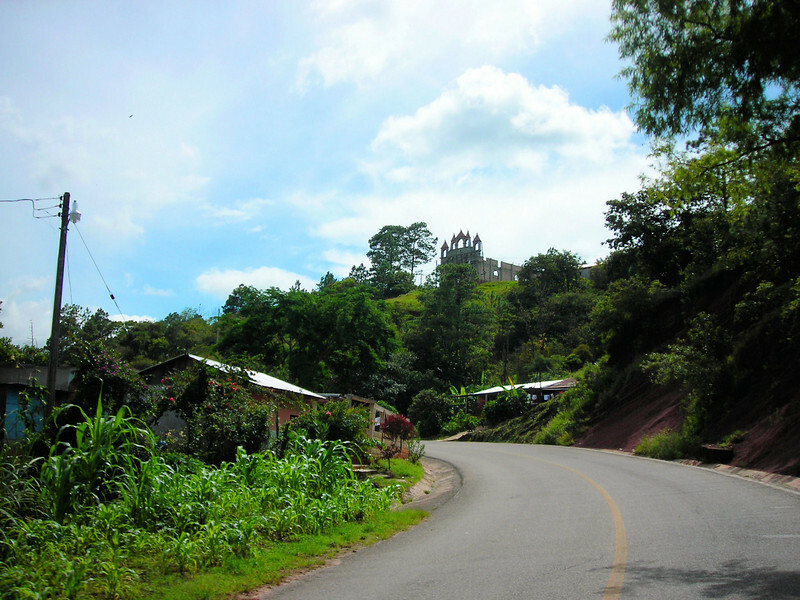 The books and ride reports I’ve read all talk about the beautiful scenery in Chiapas. No photos we took come close to describing the vast beauty of this state. 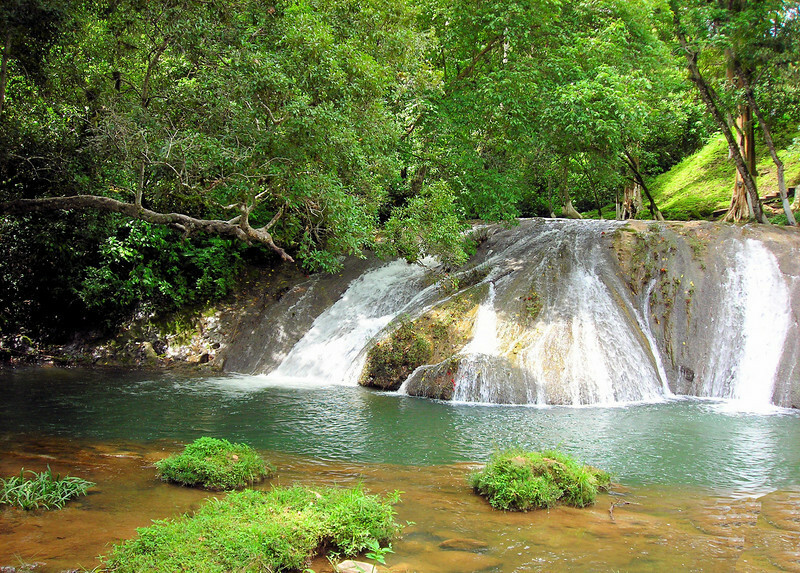 We pass several waterfalls along the roadway. 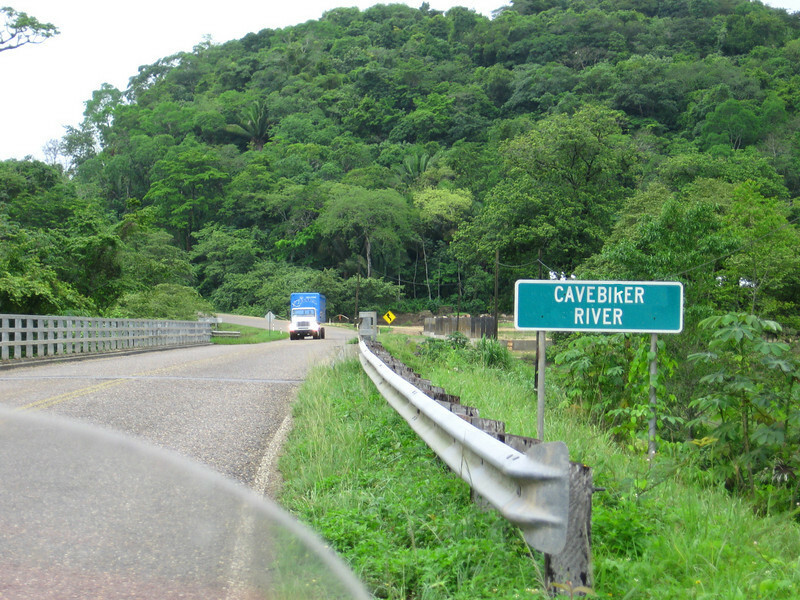 7 hours of riding with constant S curves and fantastic scenery. 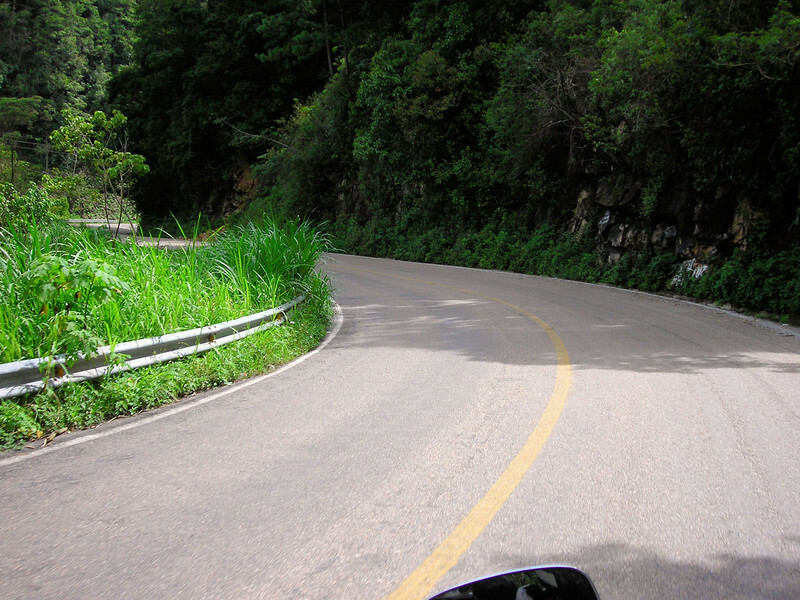 This is a dream stretch of road for bikers. The pavement is in good shape at times and is real bad at times. Sometimes the pavement on the outside third of the lane drops down six or more inches. I needed to keep a constant lookout for varying road conditions while twisting and hammering along. This is all part of a formula for a super motorcycle ride but a rider must keep hydrated and nourished in order to stay alert for such a long period of time. 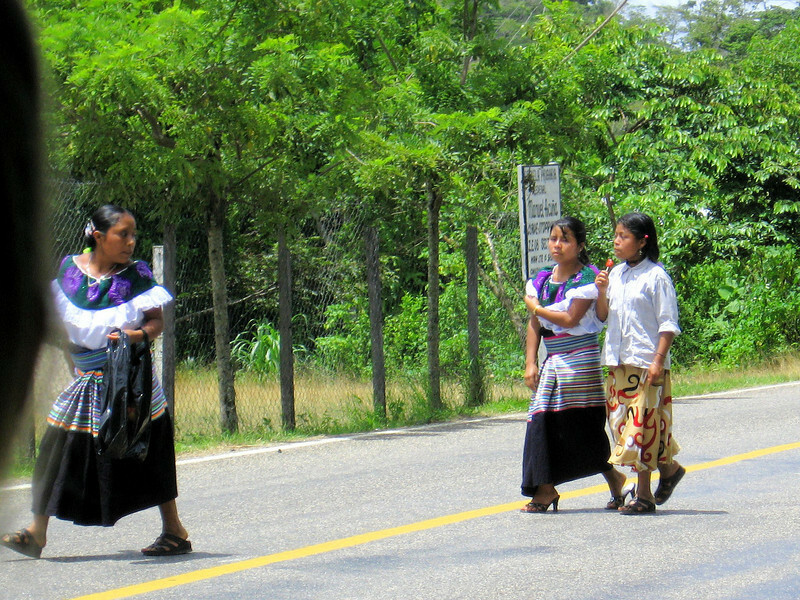 We pass groups and groups of people walking along the road. Most of the women wore traditional clothing. 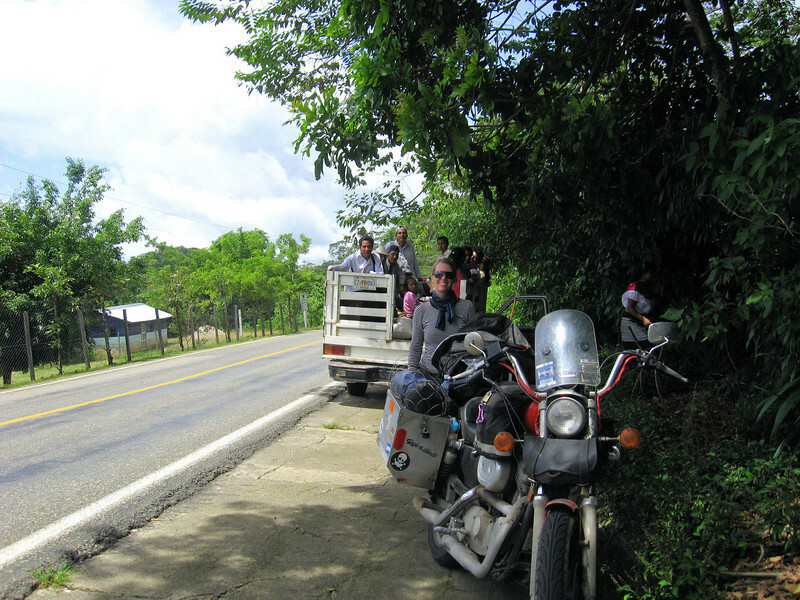 We stopped in some shade across from a small market for a snack and some water. 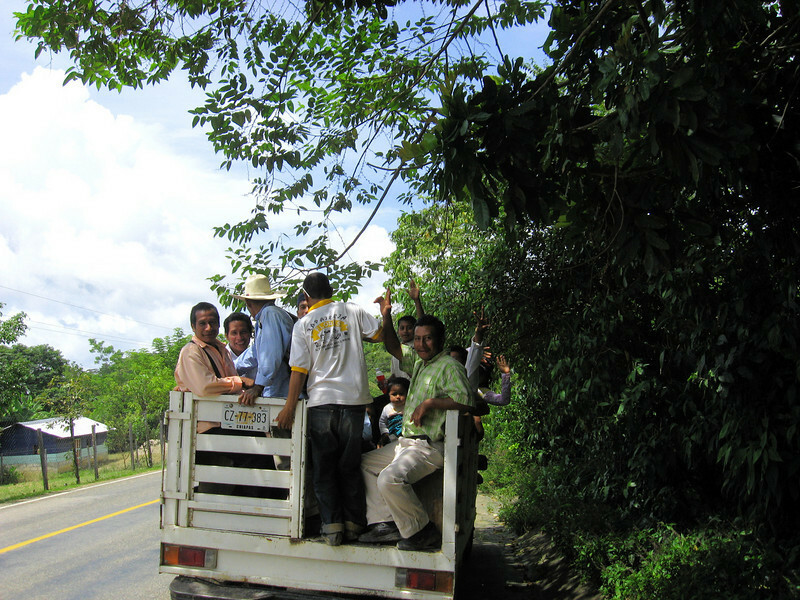 A truck load of locals stop for the same reason. After I gave them a greeting several of the men hung around us chit chatting. They spoke a mixture of Spanish and Mayan. We had a hard time understanding them but we all sure enjoyed the encounter. One guy said in Spanish “this is the language I speak and the only language I speak” all the time standing real tall and proud. 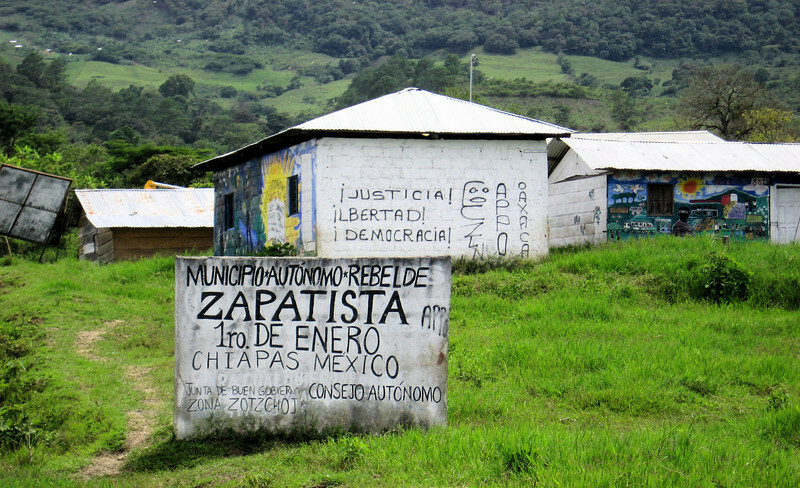 This is Zapatista territory. The last uprising was in 1994. 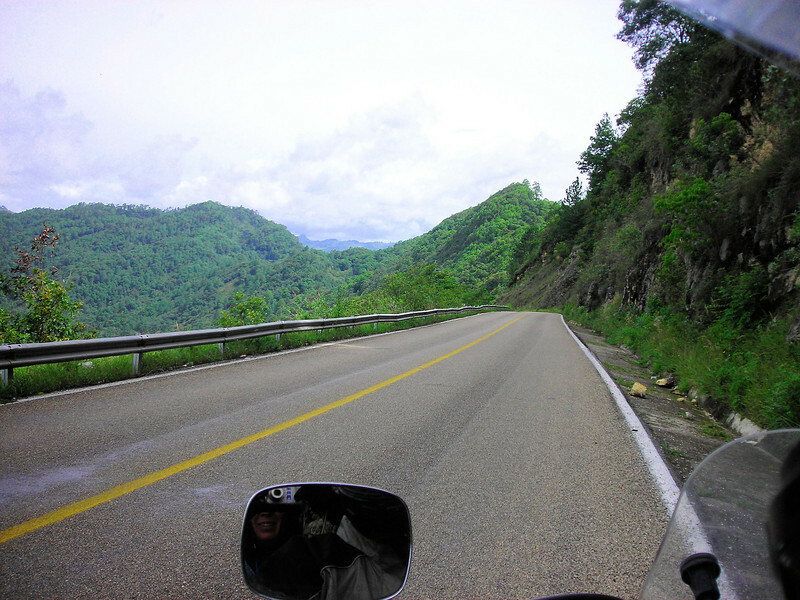 We can really feel the temperatures start to cool down now as we ride up into the hills. While resting along side the road a couple from Florida sees us and pulls over. 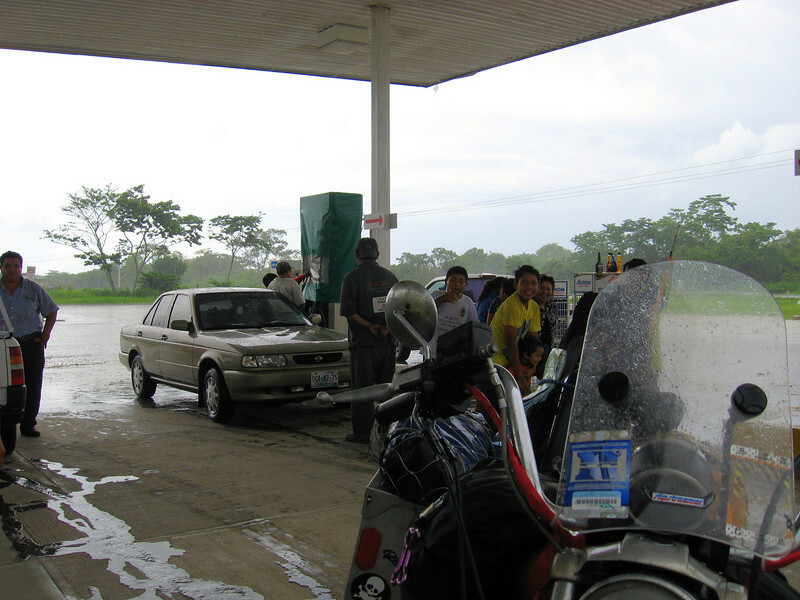 They drove down in a car but own a BMW GS. 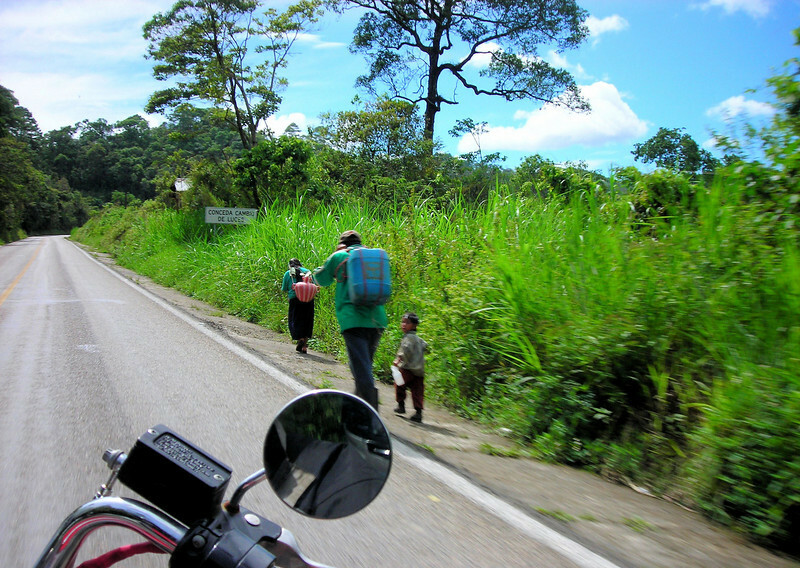 The guy wanted to talk to us about how it is to be biking through Latin America and about the border crossings. We talked for over a half an hour but we had to cut it short. 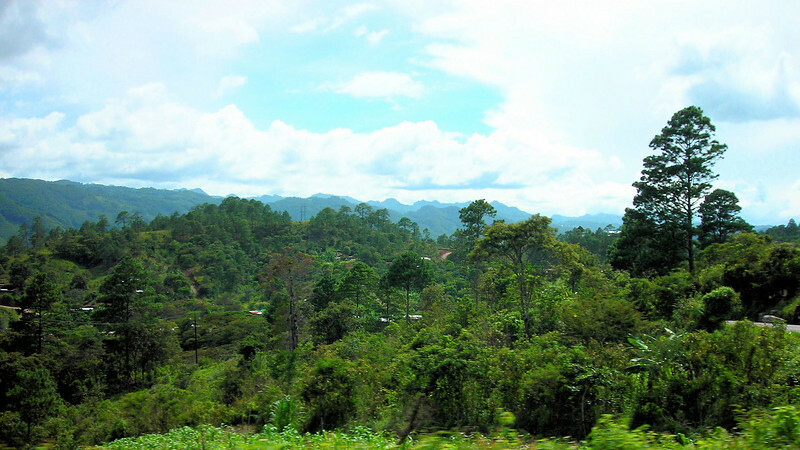 It was getting late and we were concerned about loosing daylight before we reached San Cristobal. It was another pleasant encounter. 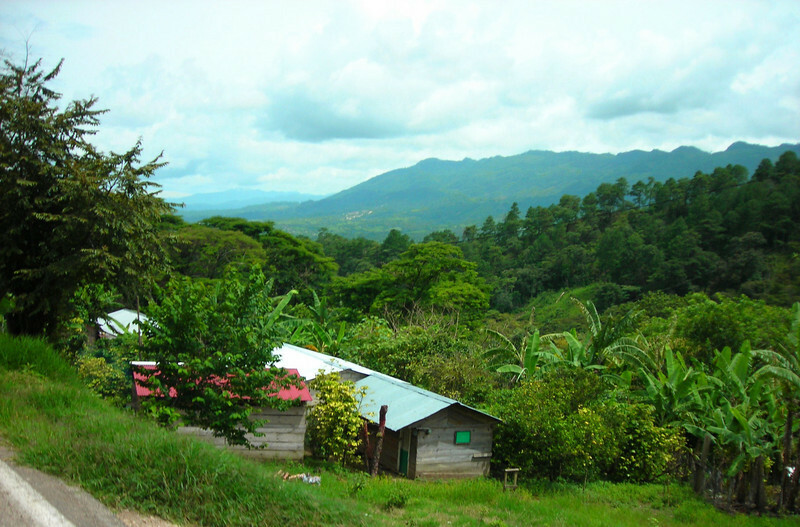 We finally see San Cristobal off in the distance. It is really cold by now. This was a long and great day of riding but it felt good to be done.